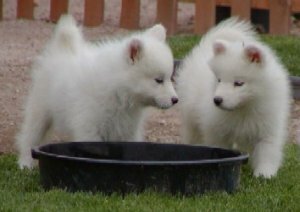 top quality Samoyed Puppies Available. The puppies are born white, 2 females and 2 males. They were born on 12/01/2011 The puppies are raised in home and family get, purchase contract. They are wormed and chipped. Our puppies are very special and will only go to approved homes. get back for more information.